The colorfully named Mutilated Currency Division at the Bureau of Engraving and Printing is a small office of crack forensics that spend their days poring over all manner of defaced dollars. 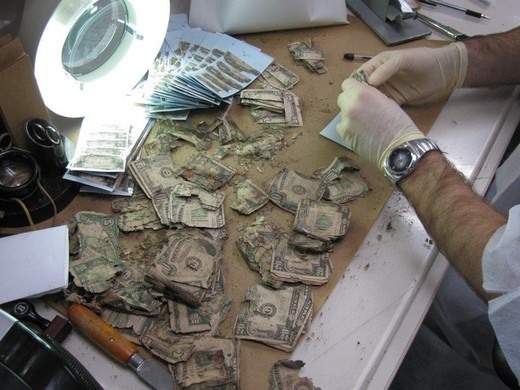 Provided for free as a public service, the Mutilated Currency employees labor to identify bits and fragments of identifiable denominations that can be redeemed at face value. 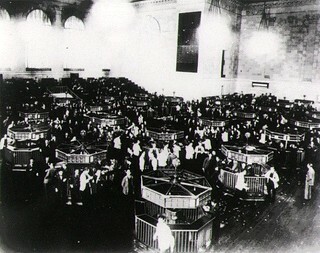 As we take it to the bank, we might recall that it was on this date in 1928, after more than 130 years of trading, that the New York Stock Exchange finally had its first day on which more than 5 million shares trade hands, as total daily volume hit 5,252,425 shares. Just over a year later, on Black Tuesday, volume spiked to over 16 million shares… as traders dumped their holdings and the Wall Street Crash of 1929 began (presaging the Great Depression). Average daily volume (over the last three months) on the NYSE today is 880,564,865 shares.